Prosecco is usually used as that perfect “start of the evening” drink. It’s tasty, clean, crisp, a great palate cleanser, and most of all, completely inoffensive. I can’t work out there’s much you can dislike about the taste of it. Feel free to comment if you disagree, but I think you’re being horribly picky if you do! In keeping with using it as an aperitif to start you off, you’d imagine the best bet would be some aperitif-kind-of foods. And you’d be right. Hard, but lightly flavoured cheeses will work. Most kinds of prosciutto crudo (basically cured but not cooked ham, Parma Ham for example) will work. Why not throw in some apple or pear chutneys to match up with the fruit flavours? Hey, go nuts! When I was researching this though, I had a glance at the website of Fiona Beckett, www.matchingfoodandwine.com. Food and wine matching aficionado, and all round lovely lady, who’s been great to many wine bloggers in the UK with her time and advice. 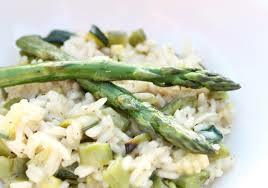 Of the umpteen different options she has on her website, the idea of an asparagus risotto sprung out at me. I love risotto, and since me and the missus picked up a Thermomix with our wedding money, they’re an absolute piece of cake to make. It’s a grey miserable day over here in London (I know, shock! ), and risotto is one of the best comfort foods going. So tonight, it’s time to settle in, risotto and prosecco at the ready, and work out if I know any of the “celebrities” on this year’s Strictly! #NWTW Week 39: What Actually Is Prosecco? The risotto sounds like a perfect idea. I also love the cheese and meat idea. Spent a week at a trendy resort in LA this summer, and my husband leaned over to me to whisper “clearly, Prosecco is what all the hipsters are drinking now.” And for once, the hipsters are absolutely justified! We really enjoyed it paired with ceviche and with a wonderful appetizer of a romaine lettuce leaf tooped with a salad of cold shrimp,chopped green apple and blue cheese. The risotto sounds great, too! A light salad like that, with the apple too, bit of cheese, sounds ace! Some nights we celebrate simplicity with a bubbly, Prosecco included, and popcorn (homemade and seasoned with a very light hand); always very good actually.